If you are a manufacturer or wholesale distributor selling products in a retail environment, it can be tough to stand out from the crowd. Visual merchandising is one key strategy for bringing your products front and center. One part an appeal to aesthetics and one part science, visual merchandising is a time-honored practice that achieves results. 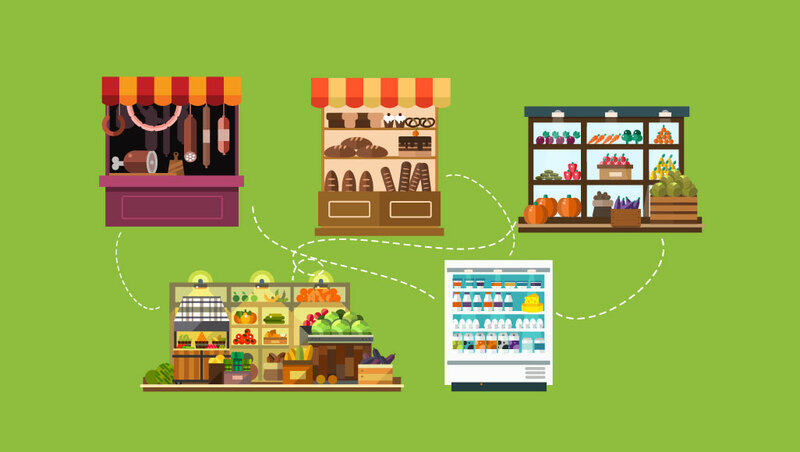 How can wholesale distributors and manufacturers help their retailers with visual merchandising? Here are a few approaches. Provide shoppers with opportunities to experience and interact with your product on end-cap and other displays. Tell your product story visually through graphics and effective signage. Provide plenty of product samples and promotional materials. Train sales reps to help retailers create experiences with your products. Banner – The banner is signage that introduces the product to shoppers and explains an offer or why they should buy it. For instance, you might create a banner offering a BOGO (buy one, get one) deal on your product. Core – The core is the middle part of the display, which may provide an opportunity to examine or interact with the product. If you’re selling hand lotion or soaps, there might be some testers available. Stock – This is the actual stock that shoppers can take home. Make sure there’s enough. Running out of stock turns an effective end-cap display into an ineffective one very quickly. Here’s how these three elements play out in your actual end-cap display. The banner introduces your product and captures the shopper’s eye. The most important element of your banner is an effective value proposition; it should give shoppers a strong reason to buy. The banner should also be visually interesting, placed at or slightly above eye level. The offer itself should be also be something interesting—a special promotion, limited time offer, a new flavor, etc. Finally, banners need an enticing call to action—something short, but effective. The core or center of your display is approximately between waist and shoulder high. In this area, shoppers can inspect or try the product. Products should be arranged in a visually interesting way that invites interaction, such as electronic product demonstrations, food product samples or personal care testers. Shoppers need to see what you’re offering, so avoid crowding too much product into this area. Ideally, larger items should be at the back, and smaller items in the front. The final element of a successful end-cap display is the stock, which will be toward the rear or below waist level. It’s critical to ensure you don’t run out of stock, so work with customers to ensure they have enough product on hand. It’s also important to keep this area tidy to avoid detracting attention from the banner and core, and to prevent sloppy stock from turning shoppers off from your end-cap. Brand and Product Information—Informational signs should enhance the shopping experience and help customers find your product. Information about your brand as well as the product or item itself should be included, set up within a product display that is intended to attract customer attention. Manufacturers and distributors can provide placement tips to help retailers optimize placement of product displays and signage to maximize traffic to your product or display. Promotional point-of-purchase—Also known as POP signage, these signs are used to advertise a featured promotion, product or service throughout the store. POP signage is typically temporary and can be used in the store entrance, aisles, customer service area and store windows, and can take forms such as aisle violators, shelf talkers, channel strips, floor graphics, ceiling danglers, end-caps, posters, counter signs, window graphics, banners and more. Be specific—Make sure the materials you provide to your retail partners include specific details about your products or promotions. Be clear and concise—Customers should be able to read and understand your sign in less than five seconds. Keep it simple. Use headlines—The most effective signage includes a headline, text and a call to action. Leave out any unnecessary words. Don’t forget the call to action—Signs have a simple goal: getting the customer to do or feel something. Signage should tell customers precisely what you want them to do. Know the customer—Work with your retail partners to learn more about customer behavior in stores to determine what type of visual merchandising will be most appealing. Make sure there’s enough—Experience is the key, so make sure customers can experience your product by having enough on hand to interact with and to buy. Giving your retailers a way to place quick reorders online can help ensure that they never run out of inventory. What visual merchandising practices and/or tactics are working best for your wholesale product or brand? Let us know in the comments.